Very good but there were some screws that I wasn't able to get in . Owner of a gorgeous poolside deck tragically lacking in places for you and your guests to sit and chat? 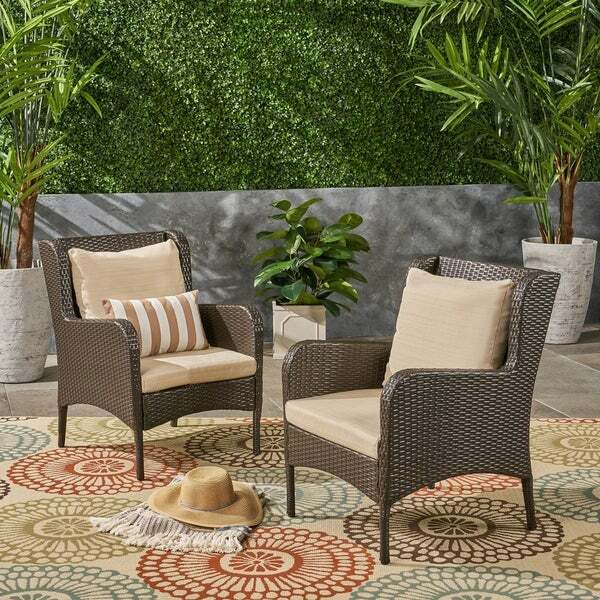 This pair of outdoor rattan club chairs may be just the ticket - their tasteful and curvy iron frames are woven over with hardy, attractive wicker, and their seating surfaces are softened with classy, subtly-piped water-resistant cushions. Dimensions 25.5 In. X 29.0 In. X 35.0 In. "Are these chairs all weather? Rust free? Etc"
The chairs are weather resistant, but we recommend they get covered when not in use.